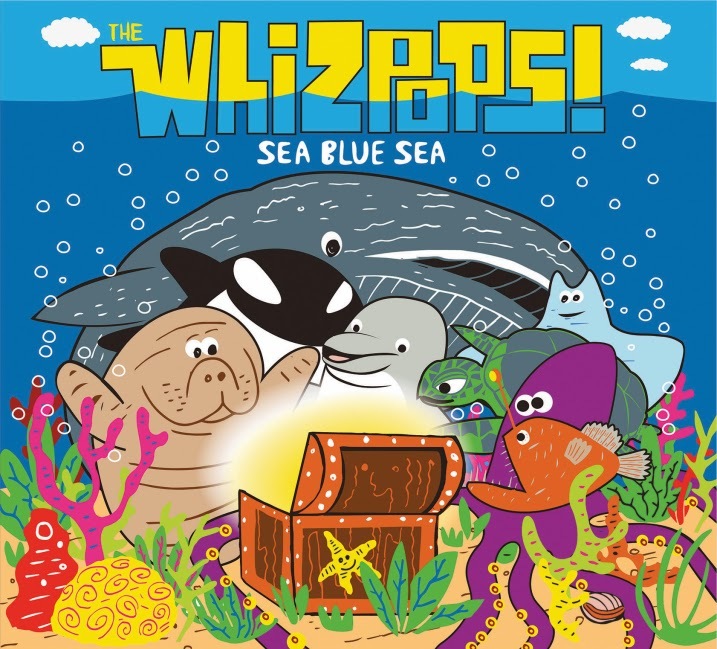 From atop the rocky slopes of Montana’s hippest town, The Whizpops travel deep into the Sea Blue Sea, their new collection of original educational songs. The Missoula-based band’s new album makes its national debut on August 19th (Stretch McCoy Records, distributed by Burnside, $9.99 SRP). The Whizpops are a Parents’ Choice and Creative Child Award-winning band featuring two elementary school teachers (Kevin Cashman and Casey Schaefer), a biologist – keyboardist (Keaton Wilson) and a fluid assortment of other talented musicians with a love of nature and science (vocalist Margi Cates is a preschool teacher; upright bassist Steve Kalling is a language arts professor; and drummer Daniel Kiely is a wealth manager, by day, for example). This talented bunch rocks venues large and small, delighting audiences of all ages. “Their lyrics are for young children, but their music will entertain most any adult,” the Missoulian notes. The Whizpops’ local album release event attracted more than 800 people at the historic Wilma Theater, and their adult fans have booked babysitters in order to rock out with abandon at The Whizpops’ regular Family Friendly shows at the Top Hat club. This is a perfect Cd for when you are learning about the ocean! So much variety of animals. Much more than just a 'fun listening' CD, you and your child will be educated while you listen as well. I loved the variety of tunes and sound in each of the songs, setting them apart from each other. Sometimes kid's music seems to 'speak down' to kids, to reach those at the younger ages like preschool and kindergarten. I understand that works well when it is aimed to that age. The great thing with Whizpops is that they don't 'talk down' to the younger set, but the younger set are still going to love the music and learn from it. The awesome thing thing about not targeting the youngest, the older ones can really glean from it as well! The songs are FUN! Plain and simple fun, and educational.. but we don't need to let them know that part of it. We listened in the car when we were driving and really had a fun time learning about the various animals, while hearing a variety of instruments and vocals. Enter to win a copy of Whizpops! Sea Blue Sea is available from Amazon, iTunes and other retailers. More information is available at www.thewhizpops.com . I like that they also have a book and song talking about dinosaurs. my daughter loves dinos. I love that it is parent's choice recommended. It must be good! I love the Owl Song, and I posted on my Facebook page. I love your songs they are totally cute and would catch the attention of any child with the unique harmonies. I love that you can watch different videos to learn about different animals.